My childhood memories of visits with my grandparents are some of my most cherished. My relationship with my paternal grandparents was particularly important to my growth. Without them, I would be a different person today. Consequently, I am sympathetic when grandparents come into my office seeking time with their grandchildren. Often, their son or daughter has died or exited the picture, and the other parent wants to exclude them from the grandchild’s life. Always I am struck by the amount of love and caring that motivates the grandparents’ visit to my office to understand their rights. Unfortunately, short of seeking custody of the grandchildren, there is nothing I can do for them. And, the situation just got worse due to Custody of M.W., No. 90072-8, a Washington Supreme Court opinion handed down this month. Visitation with a grandparent shall be presumed to be in the child’s best interests when a significant relationship has been shown to exist. This presumption may be rebutted by a preponderance of evidence showing that visitation would endanger the child’s physical, mental, or emotional health. RCW 26.09.240(5)(a). With this presumption, grandparents were able to assert a right to visit with their grandchildren. The family entity is the core element upon which modern civilization is founded. Traditionally, the integrity of the family unit has been zealously guarded by the courts. The safeguarding of familial bonds is an innate concomitant of the protective status accorded the family as a societal institution. The Court held that the “best interests of the child” standard articulated in the statutes is too broad and that the state can interfere with parental decisions “only if it appears that parental decisions will jeopardize the health or safety of the child, or have a potential for significant social burdens.” By invalidating the visitation statutes, the Court left no legal avenue for grandparents to petition for visitation rights over the objection of fit parents. While Custody of Smith and Troxel v. Granville considered a parent’s rights to control the visitation of his children, the recent Washington Supreme Court case of Custody of M.W. has considered the situation where both parents are deceased. The M.W. court concluded that, even in that situation, grandparents have no visitation rights they can assert. In M.W., the child’s parents were tragically killed in an automobile accident before the child’s first birthday. The child’s maternal grandparents entered an agreed order with the child’s paternal grandmother that gave custody of the child to the maternal grandparents and visitation to the paternal grandmother. The agreed order did not mention the paternal grandmother’s husband, who was the child’s step-grandfather. When the child began school five years later, the paternal grandmother petitioned to have her visitation modified. The step-grandfather also sought visitation in his own right arguing that his relationship with the child was like any other grandparent. The trial court modified the visitation for the paternal grandmother and allowed visitation for the step-grandfather. For some reason, the maternal grandparents did not appeal the order with regard to the paternal grandmother but did appeal with regard to the step-grandfather arguing that he should not have any visitation ordered. Two justices dissented from this opinion. The dissent noted that the statute under which the step-grandfather petitioned, which had not been invalidated by Custody of Smith, provided for a court to consider visitation when considering a third-party custody petition. It also noted that Custody of Smith and Troxel v. Granville considered the rights of fit parents, not the rights of non-parental custodians. The real issue considered in M.W. is whether the decisions by non-parental custodians should be given the same deference as the courts give parents. On the one-hand, there is a benefit to protecting a family unit even though that unit is not based on a biological parent-child relationship. However, when a court forms a new family unit in response to a third-party custody petition, there is value in allowing the court discretion to form a unit that meets the best interests of the child. Having decided who should be the child’s primary custodians, must a court stop there and not include other persons important to the child? M.W. 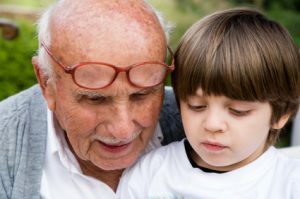 rested on what it believed to be an absence of statutory authority to grant the step-grandparents petition for visitation after Custody of Smith invalidated the third-party visitation statutes. On this ground, the Washington Supreme Court is the highest court in the land; The US Supreme Court has no say on a matter of interpretation of state law. Thus, as things stand, grandparents have no rights to visitation in Washington even when their grandchildren’s custodians are not their parents. The legislature could craft a visitation statute that gave appropriate deference to parents. The legislature has considered bills in this direction but has yet to pass one. Until it does so, grandparents seeking only visitation are completely out of luck no matter the circumstances. When the legislature finally acts, we will begin the process of defining the exact line between the parents’ right to make decisions for their children and the children’s interests to have a relationship with their grandparents. And, we may someday see a challenge to M.W.‘s statement that non-parental custodians deserve the same deference regarding their decision for a child in their care as parents do.